Gramophone award nominees Cinquecento add another glorious recording to their Hyperion discography. This vocal sextet, comprising six professional singers from five European countries, are rapidly becoming one of the most admired early music ensembles of the time. The lithe, clear yet rich and warm tones of the six singers are the perfect instruments for the complex polyphony of the sixteenth century. Their profound collective and individual musicianship, mellifluous phrasing, perfect intonation and commitment to their chosen repertoire are clearly apparent in this gem of a disc. In this recording the group uncover the complete surviving works of Philipp Schoendorff. 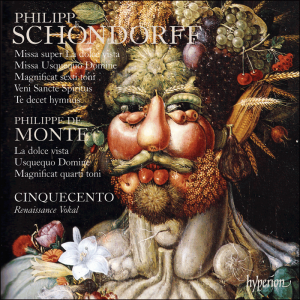 Schoendorff, originally a pupil of the illustrious Philippe de Monte, was a successful choirmaster at the Prague court of the Emperor Rudolf II. Also included are a Magnificat by his teacher de Monte and the two motets on which his pupil based his Masses. No fan of Renaissance polyphony should overlook this outstanding recording.